As I was starting to design the straight-through header I mentioned in the previous post, I was preparing a presentation about heat-pipes to an inventors group I meet with weekly. While playing with a naked heat-pipe and handling it while heating the evaporator end in a cup of hot water, I was amazed at how effective it was at transferring heat. I did some googling and found formulas for describing how effective it is, and I was even more amazed. I dawned on me that I could create a heat-pipe that extends upward from the header. I tried this with my little 4-tube show model. I just attached an elbow on one end and plugged the other end of the header. I attached a vertical 3/4″ x 12″ pipe onto the elbow and capped the end with an evacuation port. I added enough water to half fill one of the two header pipes, evacuated it from the top port and set it in the sun. The temperature of the top of the vertical pipe was only a few degrees below the temperature of the header pipe. I insulated it, but left the top 2 inches of the vertical pipe open to the air. The temperature of the naked pipe got up to 280F in partial sunlight. I realized that I might be able to transfer the heat from the header to a vertical nucleating riser using this idea. I built one the next day and it worked great. The only problem was there was a large temperature difference between the two ends of the header. The capped end was getting much hotter because the liquid dropping back down into the header from the condenser was not flowing all the way to the capped end, so it was overheating. 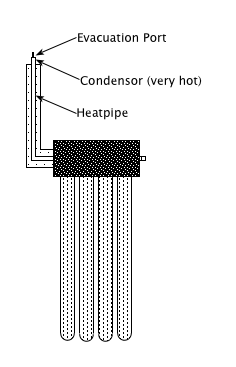 I have read that horizontal heat pipes requires some sort of wicking or capillary agent to move the liquid. One promising idea is to line the header with copper screen. Even with the large delta T the system was pumping heat to the heat-exchanger and storage tank. I have only a few digital thermometers to determine the temperatures in the systems. I need better temperature data. The vacuum tube geyser pump worked well for about a week, Then, one day, it locked up. The header pipe approached almost 350F, but the vapor condenser remained relatively cool. The system pressure stayed well below one atmosphere, approximately 12 In. Hg vacuum. My theory is that rather than nucleate boiling, the fluid in the header just evaporated, and the header emptied to its ends where a surface of water maintained an equilibrium evaporating just enough into the header to maintain slightly positive pressure. The rest of the system lost enough heat to maintain a vacuum in the vapor condenser. I was able to start the pumping again by drawing a little bit of vacuum or letting a little air in to the system, and then it would pump for the remainder of the day, but would not start pumping the next day. The solution to this would be to modify the header so that it has active artificial nucleation sites, but the holy grail I am seeking is to use the headers without modification, but I plan to test the nucleation theory by building a straight through 3/4″ I.D. header with a 3/4″ O.D. 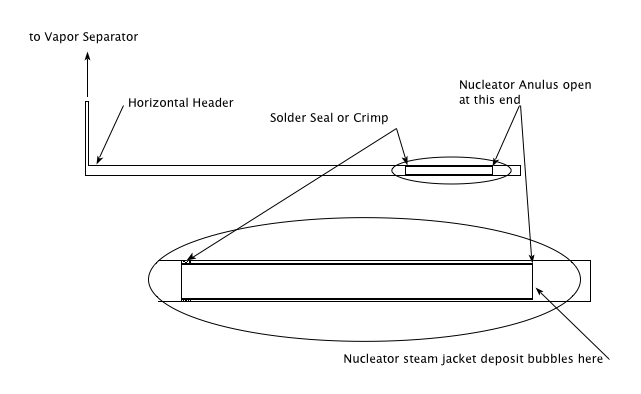 nucleator. To build a straight-through header, I will have to build wrap-around sockets for the heat-pipe condensers. I’ll build it with removable high-temperature insulation and install thermal sensors at several points on the header. I’ll start with a 4-socket header, and if it works, I’ll try to pump a 10-tube slave collector. If that doesn’t work, I’ll try building a 10-tube geyser pumping collector with a straight-through, nucleating header.